The iCreatin PoE Injector can save you money by using an existing Ethernet line to deliver data and power. The iCreatin PoE Injector can easily connect any IEEE 802.3af/at-compliant device to a non-PoE LAN switch port. This PoE Injector can be used to connect a wireless access point, IP phone, network camera, or any IEEE 802.3af/at powered device to a LAN switch. Reduce Wiring Costs With the iCreatin PoE Injector you can dramatically reduce wiring costs by powering devices through your existing Ethernet line rather than running new AC power lines. 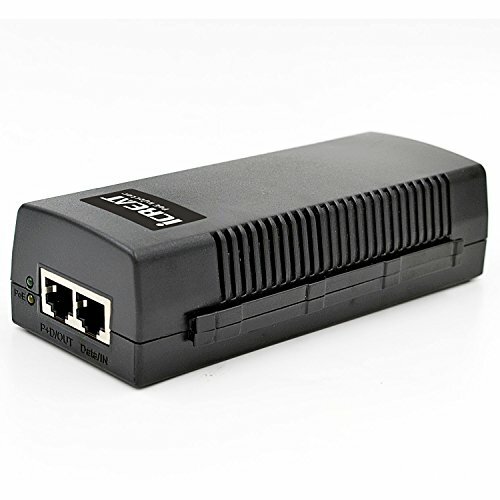 To use this PoE injector, all you need to do is connect the iCreatin PoE Injector to the LAN switch port, and then use your existing Ethernet Cable to deliver DC power and data to your device. Protect Your Equipment Now that you are running DC power to your networked equipment through the Cat5 cabling, you need to be sure that your devices are protected from power problems. The iCreatin PoE Injector is designed with short circuit protection Over Current and Over Voltage Protection, keeping your devices safe. It is also protect your products from overloads over 1.25Amps and high voltages exceeding 52V. 1 pc US power cord"
Compatible with most gigabit IP camera, IP phone, Wireless IP point, Acess Point and other PoE devices.